Did you know that fly infestations in pig and poultry buildings could be costing livestock farmers 10 per cent in lost growth rates and egg production? That could equate to over €10 (£8.50) per pig in extra feed requirement. Speaking at the recent PestEx 2015 event in London, Syngenta Technical Manager, Dr Kai Sievert, reported research studies have shown pig growth rates in untreated buildings with moderate house fly infestations, of six to 21 flies trapped per day on monitoring glue traps, were 121 days through the finishing unit, compared to just 109 days in adjacent buildings where the flies were controlled. Feed cost savings in the treated houses amounted to €15,000 a year per pig house with a capacity of 1500 head. 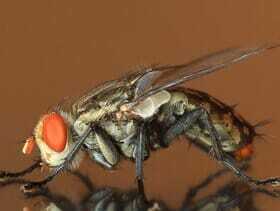 Other livestock can also be seriously affected by nuisance flies, he added. In poultry units, for example, cestodosis (internal worm parasites) transmitted by house flies reduced egg production by 10 per cent. Whilst beef units had seen weight gain reduced by up to 20 per cent where infestations of Stomoxys calcitrans biting flies exceeded 100 insects per calf. “Unless controlled by professional pest controllers or farmers, flies can carry over 100 different germs in the form of viruses, bacteria, fungi, and even worm eggs,” warned Dr Sievert, “more than 65 of which can affect humans or animals. He highlighted the presence of flies also created a bridge for disease, including between stock on different farms or buildings and from one batch of livestock to another passing through a building – no matter how thorough the physical cleaning or biosecurity measures. In these situations, the targeted use of Demand CS® or Icon® residual sprays and Zyrox® baits can be effective in minimising problem disease transmission. Dr Sievert pointed out that, with the current pressure on farmers to reduce the use of antibiotics in livestock production, there will almost inevitably be a higher background level of disease that will increase the potential risk of further spread by flies in the future. Thus the general hygiene situation has to be improved and fly control is a crucial important part of this. The threat to intensive livestock is increased since flies can breed almost all year-round in the controlled warm environment. As the temperature rises, so the life-cycle gets shorter. At 16°C the life cycle may take up to 50 days from egg laying to adult fly, but at 25°C it is typically down to 16 days and, at 35°C, can be as short as seven days. Dr Sievert advocated farmers and pest controllers should now adopt an integrated approach to fly control, combining best practice to minimise fly populations with effective insecticide treatment of livestock buildings. He highlighted the value of physical barriers to prevent fly incursion into buildings. Experience of studies on over 100 poultry farms had shown examples where cases of Campylobacter had been low over winter, but increased dramatically during the summer, he cited. Putting fly gauze on windows of the buildings had reduced the incidence of peak infection from about 55 per cent down to 15 per cent. In addition to physical barriers, he urged the need for better long-term control by removing the breeding grounds for flies. “Clearing dung and moving it away from buildings deprives flies of the organic matter necessary for breeding,” advised Dr Sievert. “Furthermore, flies will not breed in dry areas, so simple measures such as avoiding leaking water troughs especially in poultry houses can significantly help.” Dead animals are the ideal medium for flies too, especially blowflies, and should always be cleared away, he added. But whilst mechanical methods could reduce fly numbers, for most farms chemical control was the primary route to effectively keep infestations below nuisance thresholds. Typically that would include the use of adulticides to quickly knock-down problem fly numbers, in combination with larvicides to break the cycle of population build-up. Dr Sievert advocated that when pest controllers were treating walls they should spray just a third of the wall area with insecticide, such as Icon or Demand CS. “In practice that will achieve 98 to 99 per cent control of flies, but will be at a lower cost and is also a good anti-resistance strategy,” he advised. Where bait product insecticides, such as Zyrox, are being used he advocated careful placement in areas targeted where flies can be seen to be congregating, typically on window sills and tops of walls, for example. If access is difficult it can be possible to target flies by moistening card and sprinkling on the bait granules; when the card is dry the bait cards can be hung in areas where flies are active. Understanding the physical attraction of different flies is also important, pointed out Dr Sievert. The blood sucking stable fly, Stomoxys calcitrans, for example, is not attracted to bait insecticides, so will need to be controlled by spraying walls with a contact insecticide such as Icon or Demand. Larvicides applied to the surface of dung within livestock buildings can play an important role in the overall strategy to reduce fly populations. However, controllers must be vigilant since the efficacy is reduced as fresh dung builds up. Larvae prefer to stay in the upper regions of the manure, so control is reduced as soon as 10cm of new dung has accumulated, he pointed out. When it comes to insecticide selection, Dr Sievert recommended the use of at least two different classes of active ingredient to minimise the risk of resistance developing. Furthermore, when adulticides and larvicides are used in combination, there is a benefit from rotating the actives used. “It is important to look at the active and the way that it works, not simply using two different product names that could be from the same class of active,” he advised. “Effective control strategies utilising the best available proven technologies and techniques are essential to avoid the direct economic loses and serious animal welfare concerns of nuisance flies,” he added.